It has been this warm in the Yukon in the pat 13,600 years. A study from U of Toronto Mississauga uses new research techniques to reveal alarming information about climate change in Canada’s north. A study published in Nature Communications confirms that recent climate warming in the central Yukon region has surpassed the warmest temperatures experienced in the previous 13,600 years, a finding that could have important implications in the context of current global warming trends. Paleoclimatologist and lead author Trevor Porter studies climate indicators such as water isotopes, tree rings and plant waxes for signs of climate patterns in the Holocene, a period of time that spans the past 11,700 years. In glaciated regions, paleoclimate research often relies on water isotopes measured from ice core samples taken from glaciers, but in the central Yukon where glaciers have long since receded, researchers must rely on other indicators such as plant pollen and small winged insects known as midges preserved in layers of lake sediment. Pollen and midges act as proxies for ancient temperatures but sometimes offer conflicting information. 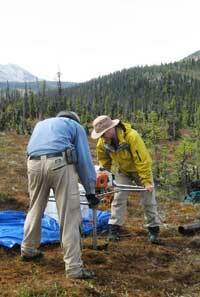 In a first for the field, Porter and his colleagues used radiocarbon dating and water isotopes preserved in permafrost beneath a central Yukon peatland to reconstruct summer temperatures over the last 13,600 years. Each summer, new peat moss accumulates at the surface, and the top of permafrost, which lies at a constant depth of 58 cm below ground, adjusts to the new surface. It simultaneously preserves precipitation that filtered through the ground and froze at the top of permafrost during previous summers. The results of the permafrost analysis confirms information provided by previous midge studies, and shows that early Holocene summers in the central Yukon were mostly warmer than the typical Holocene summer. The study further concludes that industrial-era warming has led to current summer temperatures that are unprecedented in the Holocene context, and exceeds all previous maximum temperatures by nearly 2°C. The study was published in the April 2019 issue of Nature Communications. Research funding was provided by the Natural Sciences and Engineering Research Council of Canada. Citation: Recent summer warming in northwestern Canada exceeds the Holocene thermal maximum.